Heron's Green Pool again held the most noteworthy birds - a Little Egret, six Green Sandpipers, two Dunlin and up to 25 Snipe. Little change from yesterday - the female Ferruginous Duck was still in Stratford Bay this morning, and two Black Terns were still on the main lake. Heron's Green Pool held two Dunlin, three Green Sandpipers, the Little Egret, a Hobby and a multi-colour-ringed Lapwing. Elsewhere, a Kingfisher was seen in flight at Wick Green Point this morning. An actinic moth trap produced 30 species overnight, notable amongst which were single Scarce Bordered Straw (at last! ), Rush Veneer, Red Admiral, Tinea semifulvella (appears to be the first CVL record) and a very late Riband Wave. The hoverfly Volucella zonaria was also seen whilst packing away the trap. Click here for the full list. The lowering of the water level at Heron's Green Pool had an immediate effect, as today there were 13 Snipe, two Water Rails, and one each of Dunlin, Little Stint, Green Sandpiper and Little Egret, whilst a scan over the back of the pool produced a new lake record of seven Hobbies feeding on dragonflies. Three Black Terns were new in, with the female Ferruginous Duck remaining in Stratford Bay. A juvenile Pectoral Sandpiper was found on the flash at Northwick Warth this morning, but there was no sign of the Kentish Plover. With up to six Pectoral Sandpipers, two Buff-breasted Sandpipers, a Kentish Plover, a Temminck's Stint and a Semi-palmated Sandpiper all within an hour of Bristol so far this weekend, it makes you wonder what could have been at the lake if the water levels were as low as they were this time last year! Another Osprey at Herriott's for an hour or two this evening was a nice find in what is turning out to be one of the most woeful autumns of recent years. The water level on Heron's Green Pool has now been dropped, exposing a fair bit of mud, although this is reportedly to enable the vegetation to be cut! A juvenile Kentish Plover was found on this evenings tide. Some good birds were found today, notwithstanding the lack of shoreline! The pair of Ferruginous Ducks have now located each other, and were close in off Sutton Wick first thing this morning before being disturbed by a fishing boat; also from there were two adult Yellow-legged Gulls on the bouys, a female Goldeneye, two Black Terns, a Common Tern and a Black-necked Grebe in the sailing area. What was probably a second Black-necked Grebe was in Stratford Bay at about the same time. Other birds included 34 Pintail (Herriott's Pool), and single Kingfisher, Ruff and Green Sandpiper, with the first Meadow Pipits of the autumn appearing overhead. A juvenile Marsh Harrier was seen around Nunnery Point mid-morning, and an Osprey was seen at midday, then again late in the afternoon. Highlight however was two Arctic Skuas which passed through, and were later seen flying west over Blagdon. An adult Mediterranean Gull was in the roost this evening. A moth trap run overnight produced the first Large Wainscots, Sallows and Pink-barred Sallows of the autumn, and a Vestal (following the capture of one last night). More of the same - this evening there were still 16 Black Terns, two Common Terns and a juvenile Little Tern from Nunnery Point, with a Common Sandpiper and a juvenile Peregrine also seen from there. Reports earlier in the day indicate that at least 60 terns were present this afternoon, at least 40 of which were Commons. At least the terns are finally making an effort this autumn, with a continued presence today - 23 Common Terns and four Black Terns still, with the juvenile Little Gull again, plus seven Yellow Wagtails, seven Ravens, five Pintail and a Green Sandpiper. The tern theme continues, with two Sandwich Terns, ten Black Terns, at least three Common Terns and one Arctic Tern today, along with one Little Gull and two Black-necked Grebes. At least twelve Yellow Wagtails and a Wheatear were at Woodford Lodge. An excellent site record today was a group of five Little Terns briefly at 10:30, also present today were up to 40 Common Terns, one Arctic Tern, six Black Terns, one Little Gull, a first-summer male Common Scoter, one Black-necked Grebe, and the female Ferruginous Duck at close range on the island at Stratford hide. Two Yellow Wagtails were still on Woodford Bank, and a Nuthatch was heard calling at Sutton Wick. Thanks to Roger Treeby for the Ferruginous Duck photo. There were still 16 Black Terns, three Common Terns an Arctic Tern and a juvenile Little Gull in Stratford Bay this morning; the former had increased to 30 by this evening. Also today were three Hobbies, a female/juvenile Marsh Harrier, up to twelve Pintail and two Green Sandpipers. An improvement in quality today - just past a full moon and light easterlies at this time of year are good for Black Terns, and this evening 41 of them arrived, along with at least six Common Terns and a juvenile Arctic Tern. Sometimes we get Red-crested Pochard after such conditions as well, so the duck flocks might be worth keeping an eye on. Also today were three Yellow Wagtails at Woodford still, twelve Pintail, one Garganey, two Black-necked Grebes, and one Dunlin, flying around the lake looking for some mud this evening. One adult Black Tern and three Yellow Wagtails were seen today. 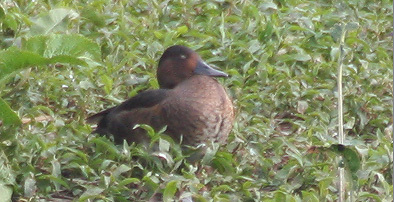 The female Ferruginous Duck was still present today. The Black-necked Grebe was still in Stratford Bay, with a Common Tern and Hobby over the main lake. Two Turnstones were seen in flight from Herriott's. An expected addition to the Chew moth list came in the form of the Horse Chestnut leaf-miner Cameraria ohridella; mines were found at both No.1 and No.2 picnic sites. 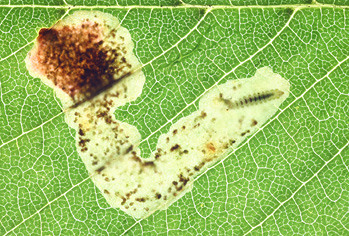 This species recently had a lot of publicity as it was new to Britain in 2002, and is now spreading across the country infesting Horse Chestnut trees. Although there had been no Avon records prior to last month, the species is now known to be widespread in Bristol, albeit at a very low density. The Black-necked Grebe remained in Stratford Bay, with two Yellow Wagtails and a Raven the best of the rest. A Black-necked Grebe in Stratford Bay was the best of a mediocre bunch today - three Wigeons, a Hobby and two Ravens were also seen.